Here is a hidden gem that I would probably have never found on my own…which would have been a true shame. 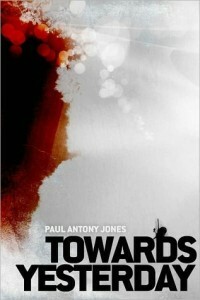 Towards Yesterday by Paul Antony Jones. Towards Yesterday is an apocalyptic, science fiction thriller, that kept me sneaking away to read my Kindle for the entire Memorial Day weekend. Engrossing, thought-provoking, filled with lasting, vivid imagery, the story gripped me early, and didn’t let go through the very last page. Based around a future scientific experiment gone terribly awry (apocalyptic level destruction and death toll), the story ties together several strangers, as their post “event” paths collide, with potentially even deadlier consequences for humankind. If you like post apocalyptic books, you will love this read. My only complaint about the book? It ended. Towards Yesterday is a relatively quick read, which will both satisfy and leave you yearning for more. I highly recommend it! And at 99 cents…you can’t go wrong. Additionally, this is a self-published title that contains few, if any, of the grammar errors or typos that some earlier readers of MY book would have encountered. A fantastic first effort…I look forward to reading more of Paul’s work. You can find the link to his book under Book Club Links.